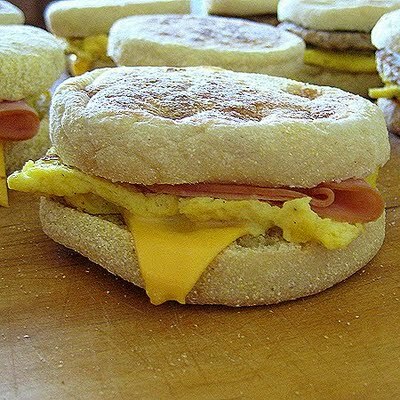 Do your children enjoy those fast food muffin egg sandwiches? Use this simple recipe from Real Mom Kitchen to fill your freezer with on the go Egg Muffin sandwich's and save money. Click here to read more from Real Mom Kitchen. Scramble eggs; while eggs are cooking, split and toast muffins. (I cooked my eggs more like an omelet and then cut them into 12 squares) Once eggs are cooked, set up an assembly line of muffins, eggs, cheese, ham; assemble and allow time to cool, then wrap in plastic wrap. Freeze wrapped egg sandwiches in freezer bags or freezer boxes. I used a gallon size freezer bag to hold 4 sandwiches, these bad can be reused for each time I make them. Makes 12. To heat: wrap in a paper towel and microwave for 45-65 seconds. Be careful it will be nice and hot. This is such a great idea! Why didn't I think of this? These are awesome! We made a giant batch of these (60 if I remember right) as part of a cooking combine a few months back - cooking the eggs in muffin pans makes for easier working if you're making lots of them, and they come out around the right shape. Also, they tend to vanish pretty quickly! Thanks for the great recipe! I'm sure my kids are tired of homemade muffins for breakfast, so these would be a great alternative!